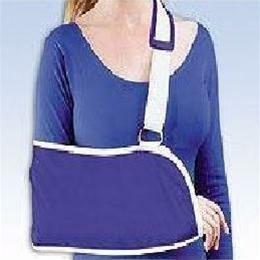 Traditional envelope arm sling comfortably distributes the weight of the arm following surgical ornon-surgical treatment of the arm, hand or shoulder. Made in a strong, seamless quality design. Fast andsimple application with slide buckle adjustment. Comfort padding on shoulder strap. Poly/cotton material.Color: Navy.